This is a lovely, light and refreshing summer white wine from Candoni. Costco is selling this for $9.99 which is the lowest price I’ve seen it for (I’ve seen it as high as $16 some places). If you already love Moscato, then dropping this one in your Costco cart is a no brainer. You’ve probably done it already if you’ve seen this bottle at your store. 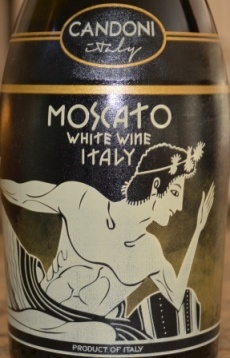 If you’re not a Moscato fan yet, this is a very nice entry point. Moscatos are light, low alcohol, easy sipping wines, perfect for before or after meals. I confess to even cracking them open after I mow the grass on a hot day. Some Moscatos can be overly on the sweet side but I found this one to be rather well balanced. There’s a light effervescence. Flavors I picked up were apricot, peach and mango. Overall, this is a nice buy. A good party wine with a cool label acknowledging the Etruscans who many believe were the first to plant and harvest grapes in Italy (for more on Italian wines). I’m going to put this in our top picks list because of the cost savings and its standing as a solid white wine buy in the warehouse right now.